While people get excited about numbers like Pi and e, the familiar small numbers one to nine hold a magic all their own. Did you know that if you do eight perfect riffle shuffles on a deck of 52 cards, you always get the original ordering back? Or that among six people, either three of them must be all friends or three must be all strangers? And what does the perfect size of paper have to do with the square root of two? 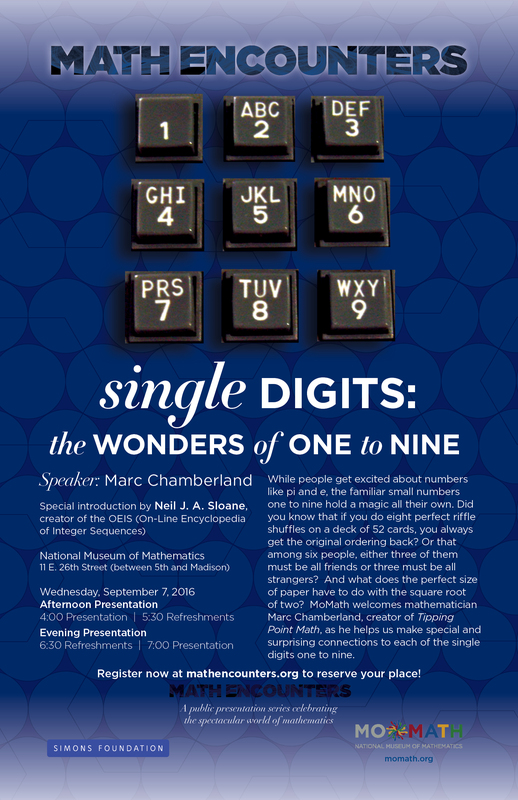 MoMath welcomes mathematician Marc Chamberland, creator of Tipping Point Math, as he helps us make special and surprising connections to each of the single digits one to nine. Click here for the 7:00 pm presentation. Math Encounters is a public presentation series celebrating the spectacular world of mathematics and presented by the Simons Foundation and the National Museum of Mathematics. Please note, this presentation is designed to be accessible and engaging to a general audience. As a rule of thumb, it would be best enjoyed by participants age 12 and up.